Two victims wounded, one seriously, in stabbing attack at Netanya market. Two people have been seriously wounded in a stabbing attack in the coastal Israeli city of Netanya. 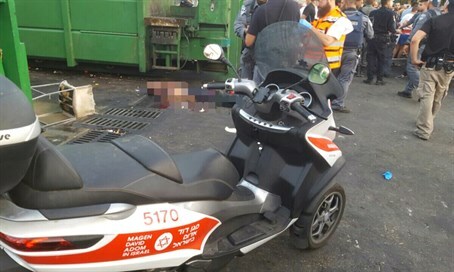 Magen David Adom (MDA) paramedics who arrived at the scene in Netanya market said they found a 30-year-old woman in serious condition, and a second victim - a man in his 40s - with moderate injuries. Both victims were given emergency first-aid treatment before being evacuated to Laniado Hospital. The terrorist was shot dead at the scene, and was later identified as a resident of the nearby Palestinian Authority city of Tulkarem. The attack is the second such stabbing by Arab terrorists Thursday. Earlier in the day, a teenage terrorist broke into a home in the Jewish town of Kiryat Arba, next to Hevron, and stabbed to death a 13-year-old girl as she slept in her bed. Hallel-Yaffa Ariel was buried amid heart-breaking scenes, at roughly the same time as the Netanya attacker struck. The two attacks mark a spike in Arab terrorist attacks, which had dropped considerably in recent weeks after more than half a year of a relentless wave of terror.